Whenever I come home from work, I stand in the doorway as my mother calls out to The Boy, "Look who's home. Come and say Hi to Mommy!" I wait for a few seconds with my jacket on and my purse in hand. I am usually tired by the time I walk in at 6:30 and just want to kick off my shoes, peel off my clothes, scrub the subway filth off of my hands and lay down on the sofa. But I wait anyway. Hoping The Boy will run out from where ever he is to say hello and maybe even give me a kiss. Some days, he will. On the days he greets me at the door, his reaction varies. Sometimes I get the kiss. Sometimes it's just, "Hi Mommy." And sometimes, he runs to the door, jumps up and down frantically flapping his hands. Some days he just won't get up or look up. And I have to go to him. I have learned not to take it personally. Though I'll admit, I would love to walk in the door one day and have The Boy run up to me, say Hey Mom and give me a kiss - without any prompting to do so. I have accepted that it's just not what he does. It's not that he doesn't love me - I know he does. It just does not occur to him to do these things. Just like it doesn't occur to The Boy to say hello to other children in the playground - even if they say hello first. That's one of the components of autism - the social connection, the inability to interact and communicate appropriately with others. The social connections that come so naturally for some parents and their children - is something that The Husband and I work on. Every day. Because it doesn't come naturally to The Boy. The puzzle piece is the international symbol for autism because it's "a puzzling conditioning [that] isolates them from normal human contact and therefore they do not 'fit it.'" 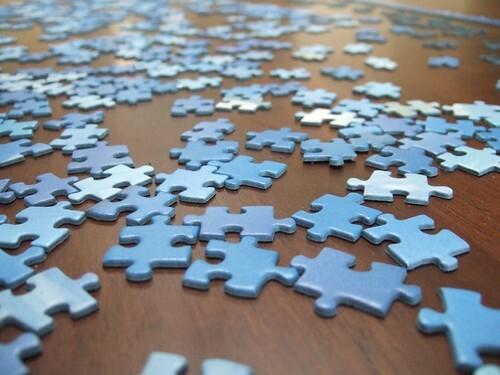 But autism is not the puzzle I'm trying to put together. The puzzle for me is trying to find new ways to connect with The Boy. Connecting different pieces together to see what works. And there are moments when I know the pieces I've put together, fit perfectly. Moments when he spontaneously says, I love you. Moments when he looks around the apartment and asks "Where did Daddy go?" Moments when he sneaks up on me and asks what I'm doing. Or when The Boy grabs my hand and asks me to read a story. And that's when I put down whatever I'm doing to read to him. For our family, reading is how we best connect. There are times when I read the same book - 2, 3, 4 times in a row. We take turns reading the lines. I ask him to point to words or pictures. I ask him to spell words. When I'm reading to The Boy, he complies. He listens. But the moments I love most are those few seconds before he falls asleep. After we've read our books. When The Boy's body and mind have calmed down to the state of exhaustion and he's able to stay still. When his eyes are closing and opening, reaching for my hand, not wanting me to leave. And even though The Boy's five years old and should learn to go to sleep alone. I will wait. The Husband will wait. Because we need those moments. We need to know that The Boy wants to connect with us. To be a part of us. 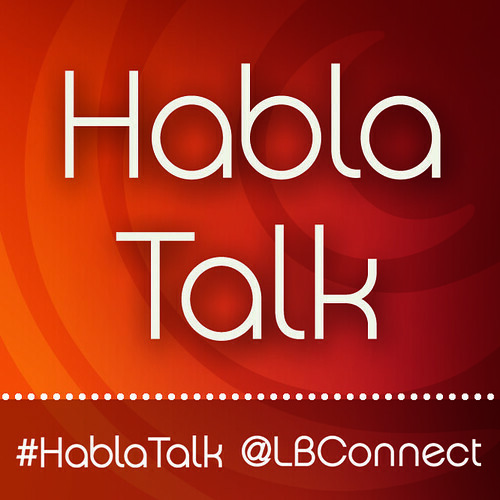 Post inspired by a bi-weekly blog prompt called #HalbaTalk through Latina Bloggers Connect.